By all accounts, the 29th Salon International de la Haute Horlogerie, better known as SIHH, was a success. With 35 of the world’s leading luxury watch brands unveiling their novelties for the year in Geneva, Switzerland, the first big watch fair of the year hosted over 23,000 visitors. And there were a lot of great new watches on display with some strong trends like salmon and pink gold dials, white metal and blue pairings, vintage inspirations, and unisex watches. While it was tough to pick out the best of SIHH 2019, here are our favorite new watch releases. Limited to just 250 pieces, the new Lange 1 “25th Anniversary” is a stunning watch to commemorate the quarter-century existence of the A. Lange & Söhne flagship model. In fact, the Lange 1 was one of three watches that kickstarted the revival of the storied German watchmaking brand. 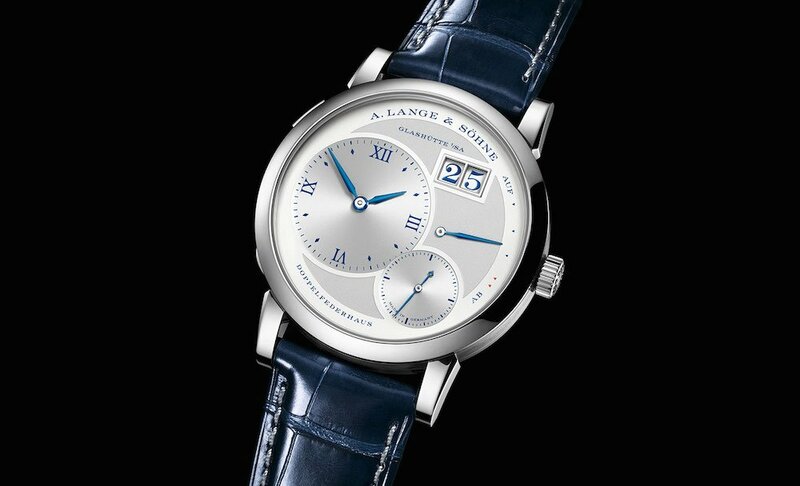 The new Lange 1 “25th Anniversary” watch features a white gold 38.5 mm case fitted with a hunter case back. The solid silver dial houses the familiar asymmetrical layout comprising of an oversized date window, a power reserve indicator, a running seconds display, and finally, the hour and minutes subsidiary dial. What’s more, matching the blue details on the dial is the blue alligator strap. 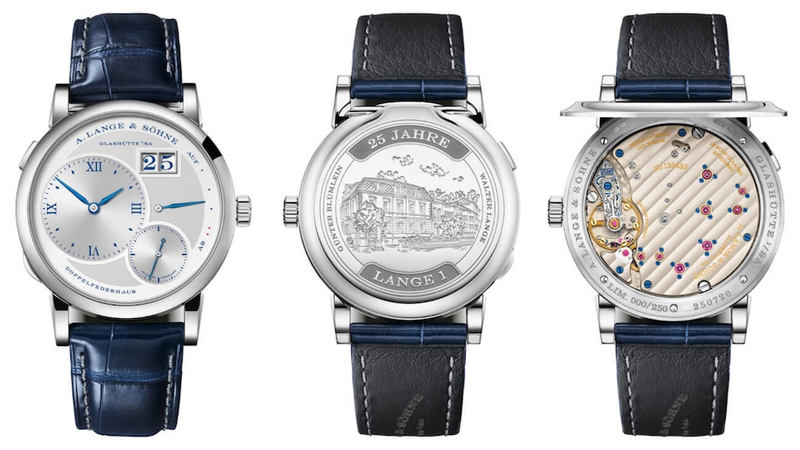 Flip the watch around and you’ll spot an engraving of the Lange Headquarters, in addition to the inscription “25 YEARS LANGE 1”. Open the hinged cover and you’ll see the beautifully decorated manual-wound Cal. L121.1, complete with the silver three-quarter plate. Although most of the chatter was surrounding the brand new Code 11.59 collection from Audemars Piguet, one new watch release that really caught our eye was the Royal Oak Chronograph in a new smaller 38 mm size. 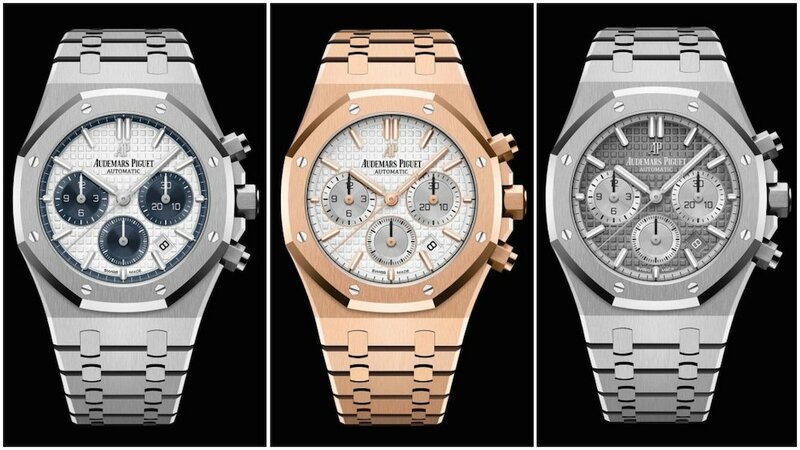 The Audemars Piguet Royal Oak Selfwinding Chronograph 38 is following the watch industry’s inclination towards making gender-neutral watches that can fit either men or women. The new RO Chrono is currently available in stainless steel or rose gold, with a few different dial options. The dial, of course, includes the characteristic “Grande Tapisserie” finish along with the trio of registers at 3, 6, and 9 o’clock. Powering the new self-winding Royal Oak Chronograph 38 is the dependable Cal. 2385 movement with 40 hours of power reserve. The biggest brand by far to showcase at SIHH is Cartier. And given its very long history making some of the world’s most iconic (and more importantly approachable and wearable watches) that is not a surprise. Following up the redesign of their famous Santos watch last year–which has a history that dates back to 1904 when Louis Cartier gave aviator Alberto Santos-Dumont a wristwatch to wear whilst flying–in 2019 Cartier added plenty of new watches to the collection. One standout model was the the large version of the stainless steel Santos with a new metallic blue dial. The blue gradient dial is lighter in the center and gradually gets darker towards the square frame. In striking contrast to the blue are the mirrored finished Roman numerals, luminescent sword-shaped hands, and white minute track. There’s also a discreet date window tucked away at 6 o’clock. 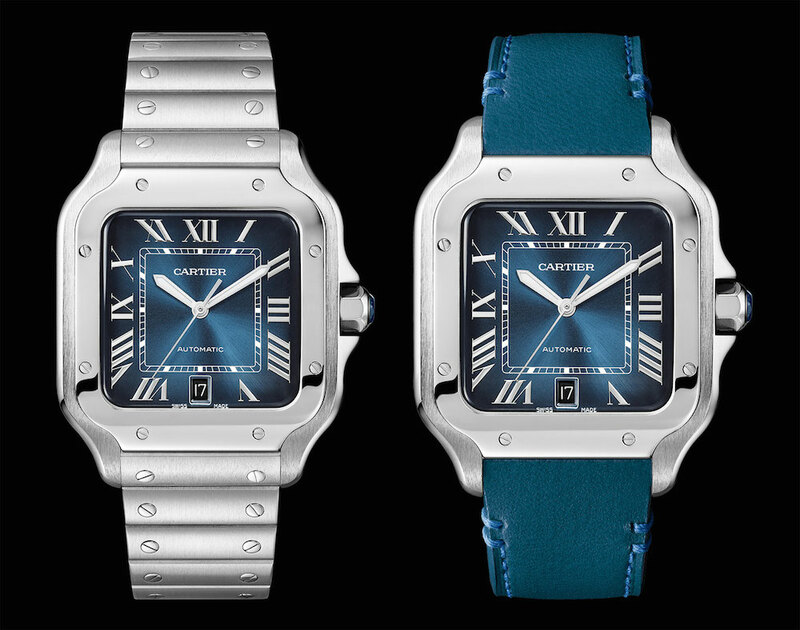 As a new-generation model, the blue Santos is fitted with Cartier’s practical QuickSwitch strap system. Similar to other large Santos modern models, the watch runs on the in-house Cal. 1847 MC automatic movement. 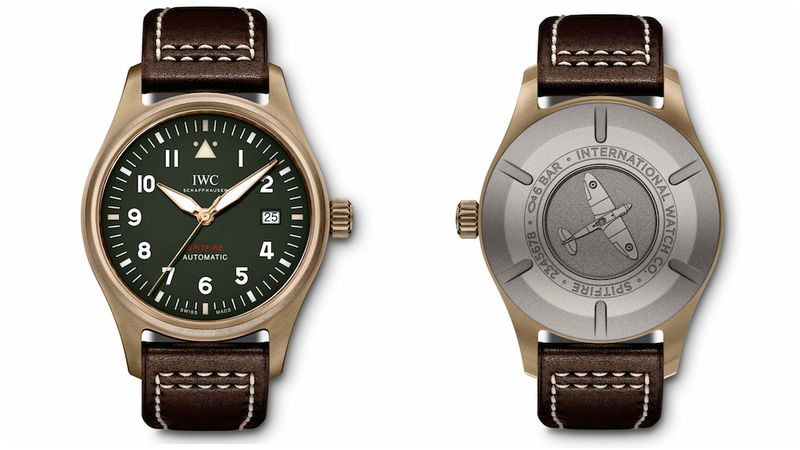 2019 was the year of the Pilot’s Watch for IWC with plenty of new models joining the “Spitfire” line–which is a tribute to the vintage airplane. While there was a range of different models from perpetual calendars to chronographs, the star of the line up in our opinion was the simplest of the fleet in bronze. The IWC Pilot’s Watch Automatic Spitfire sports a striking bronze case (which will develop its own unique patina over time) measuring a well-proportioned 39 mm. Inside that case sits an olive green dial with the vintage-inspired Mark II British Royal Air Force watch layout. The green shade looks particularly appealing next to the bronze exterior and brown calfskin strap. At the heart of the new watch is the in-house Cal. 32100 automatic movement that utilizes the pawl-winding system for a generous 72-hour power reserve. In a surprising move, Panerai only focused on their Submersible collection of dive watches this year, highlighting the fact that there is indeed a slew of Panerai watches that you can take scuba diving. An interesting twist Panerai added to three of their limited-edition Submersible novelties is the opportunity to partake in exclusive experiences. These include a dive with freediving champ Guillaume Néry, an expedition with explorer Mike Horn, and a two-date training with Commandos of the Italian Navy. 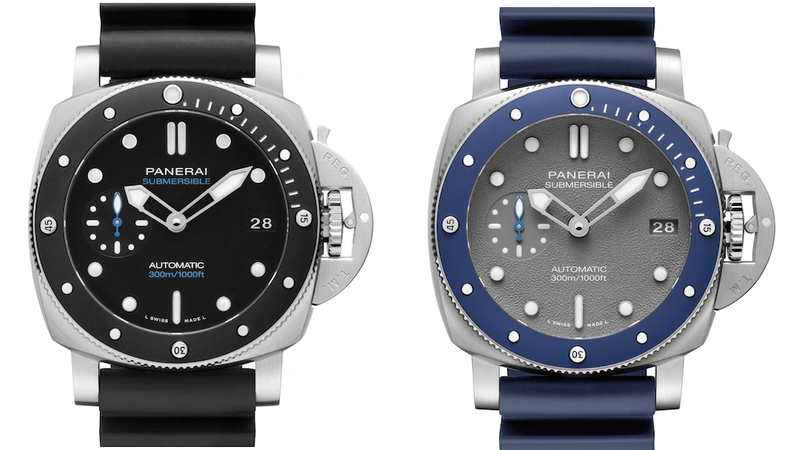 However, the new models that we like most for their wearability are the two fresh Panerai Submersible 42 watches. Available with either a black ceramic bezel and black dial or blue ceramic bezel and gray dial, both models include 42 mm steel cases, which in the world of mega Panerai watches is demure. The watches are water resistant to 300 meters and thanks to the automatic Cal. OP XXXIV, have a power reserve of 72 hours. In 2016, Piaget redesigned their famous luxury sports watch collection, the Polo. Compared to the original Piaget Polo watches that made their debut in the 1970s, the modern versions are a different breed altogether. Naturally, the brand continues to round out the collection as illustrated by these three new Piaget Polo models. 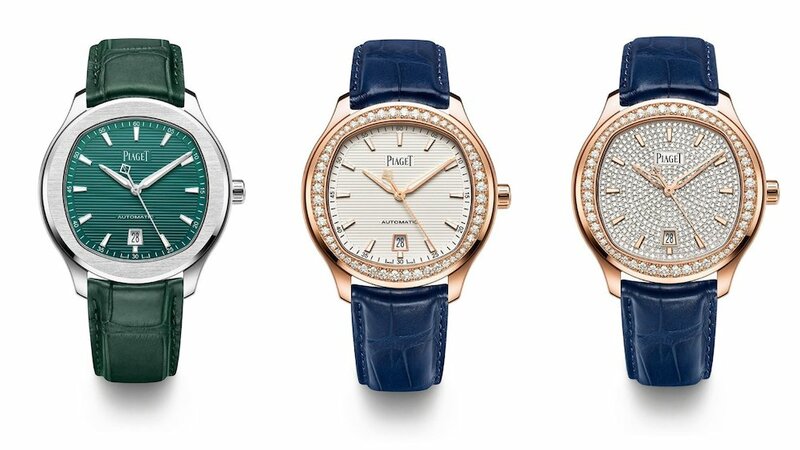 All three of the 2019 Piaget Polo watches come with 42 mm round cases, cushion-shaped dials, leather straps, and Piaget’s self-winding Cal. 1110P. But where they differ is in material and color. First up is the limited-edition (500 pieces) steel Polo S with a horizontal grooved green dial and a matching green leather strap. Next in line is the pink gold Polo with a cream colored dial, gleaming diamond-set bezel, and blue leather strap. Last, but certainly not least, is the pink gold Piaget Polo with a full diamond pavé dial, diamond-set bezel, and blue leather strap. Yes, most people were blown away by the mechanical mastery of the new Vacheron Constantin Traditionnelle Twin Beat Perpetual Calendar. After all, this incredible high-complication watch offers an unheard of 65-day power reserve thanks to a clever “standby” mode. However, we were smitten by the new versions of the Vacheron Patrimony. For an elegant dress watch, it simply does not get better than the ultra-thin Patrimony timepiece. 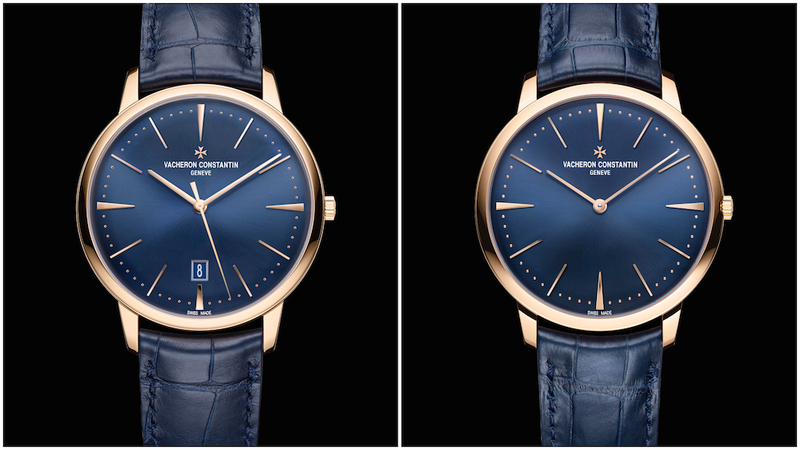 And for 2019, Vacheron Constantin refreshes the collection with a striking midnight blue dial, pink gold 40 mm case, and blue leather straps. There’s the choice of the automatic Vacheron Constantin Patrimony with a date window or the manual-wound time-only Vacheron Constantin Patrimony. Ulysse Nardin has always made it a point to flaunt their innovation. And in 2001, the brand unveiled the groundbreaking Freak watch, which made away with standard watch details like hands, winding crown, and dial and instead, used components of the movement to display the time. For the past 18 years, Ulysse Nardin has continued to evolve the Freak collection. So, for 2019, they introduced a pared-down version intended for a whole new audience. Inside the Freak X watches is the new flying carrousel Cal. UN-230 automatic movement, which true to the spirit of the Freak still uses the central bridge as the minute hand and one of the wheels as the hour indicator. New to the model however is the smaller 43 mm size (versus the preceding 45 mm diameter), as well as a winding crown. 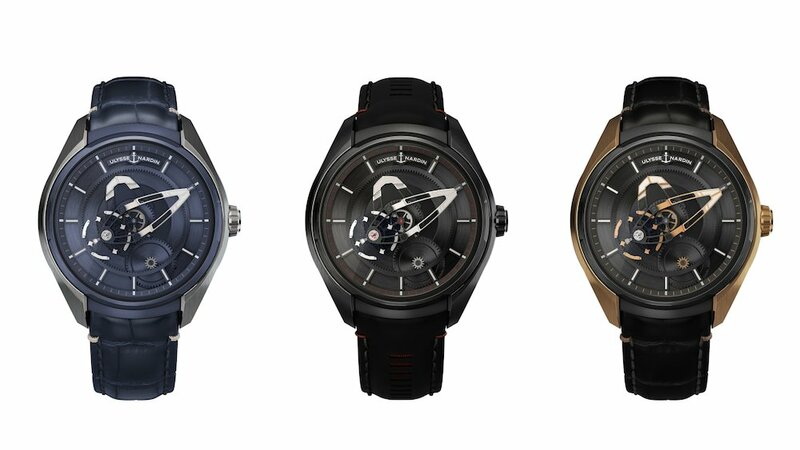 There are four new versions of the Freak X: titanium with blue PVD finish, titanium with black DLC finish, rose gold with black DLC titanium, and Carbonium–an eco-friendly material from the aeronautical industry.